Cancer Awareness Week at Princeton Day School officially begins on Tuesday, January 22, but preparations have been underway all week across the School. Follow all of the initiatives and coverage on our Cancer Awareness Week web page. Our 4th Grade leaders in the Service Learning group created and showed a video to educate fellow PreK-Grade 4 students about cancer. 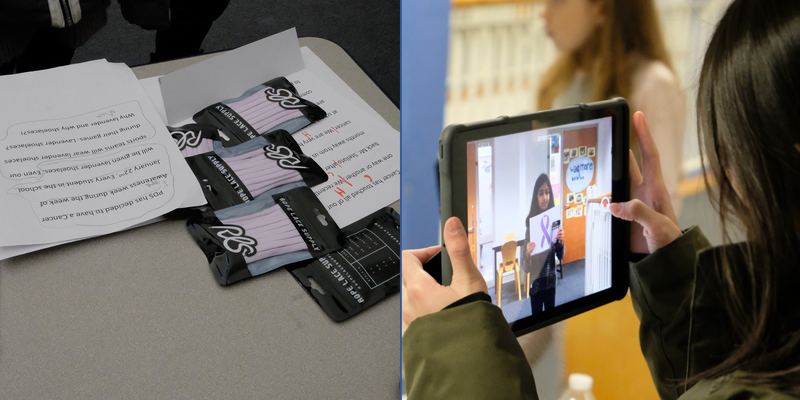 In the video, and at student gatherings across all grades PreK-12, students spread the word that lavender is the universal color for all cancers and asked their classmates to join in supporting awareness-raising efforts next week. Faculty, staff and students received their lavender shoelaces and are finding creative ways to wear them in school and at advocacy events. Upper School biology students and others are preparing informational posters. Student Council leaders have coordinated a cross-divisional project that will be unveiled next week. Middle and Upper School students researched healthy recipes and are planning a "pay it forward" Bake, Share and Be Aware day on Friday, January 25. Their goal is to raise awareness of how important nutrition and diet are in maintaining good health; rather than paying for the snacks, "customers" will share in return how they will pay forward this act of kindness and caring. Third grade teacher and Director of Service Learning Margie Gibson said, "As we prepare to observe Cancer Awareness Week at PDS, it is wonderful to see older students playing a crucial role in helping our faculty to develop age-appropriate lessons and activities for the younger students, so they can participate actively in the week's events. Thanks to these efforts, our entire Pre-K - Grade 12 community is coming together with a message of hope and healing." Don't forget to support cancer awareness and our Panthers at athletic games throughout the week of January 22-25 (schedule on Cancer Awareness Week web page). For those unable to attend the Princeton Day School-Lawrenceville varsity ice hockey game at Princeton University's Hobey Baker Memorial Rink, you'll still be able to tune in via live stream thanks to Play by Play; at 6pm on January 24, you can watch here: https://www.youtube.com/watch?v=ZfL4ylSPs8g.